Also, if you know an answer to a question posted, feel free to answer it! That way we can share information and experiences. Finally, I'm looking for a name for the series. 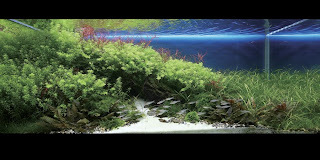 I've tentatively picked Aquascaping Answers, but if you have any better ideas, leave a comment! 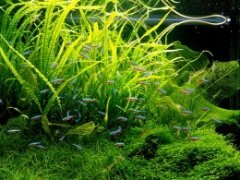 I was doing some research on the compact florescent bulb lighting system on my freshwater planted aquarium. (20 gal). I found out that I have this bulb. I read online that this bulb is likely structured for a salt water reef tanks. Apparently actinic light is supposed to benefit corals. Other sources seem to suggest a K rating closer to 6700 for fresh water plants. The best bulb available that I cant find is a 10000k/ 6700k 40 watt bulb. Will this make any difference? My tank is relatively clean, free from algae, but I do get green dust algae on the glass. It stays off the plants, but I can't seem to keep it off the glass. Any recommendations? I don't believe I'm over feeding and I've cut my lights back a few hours. Is it just a matter of more regular water changes? This means that a 10000K bulb can be much more efficient growing plants than a 6700K - and vice versa. The Aquarium hobby does not need the kelvin measure. I really enjoy this blog but this is not the medium for this type of post/topic/discussion/etc. There are lots of resources out there already devoted the the Q's & A's we all have. The focus should really be on aquarium topics, reviews, etc. Just my two cents. Thanks!